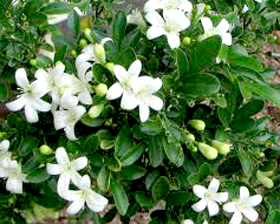 Murraya paniculata, commonly called Orange Jessamine, is a tropical, evergreen plant bearing small, white, scented flowers, which is grown as an ornamental tree or hedge. Murraya is closely related to Citrus, and bears small orange to red fruit resembling kumquats, though some cultivars do not set fruit. Scarify seeds – rub a little with sandpaper, to let the water penetrate. Soak in warm water for 3 to 4 days. Sow 0.5cm deep in standard potting mix. Cover with a clear dome or plastic sheet. Keep soil moist at all times. Maintain an optimum temperature of 21 to 26°C.